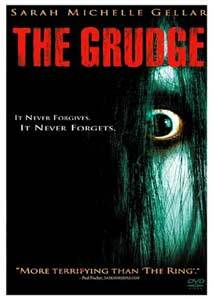 The Grudge is the Western remake of Takashi Shimizu's 2003 über-creepy Japanese ghost story, Ju-on (actually a series of four different yet similar films), and was blessed and nurtured by the great Sam Raimi, whose distinctive American horror roots are highly pedigreed. Raimi's involvement was to have Shimuzu direct the remake, along with his original crew, and while it is certainly a novel idea, things like this don't always work out for the best; George Sluzier was given a similar shot with the disturbing thriller The Vanishing, and his Hollywood remake was just a botched mess from the get go. In the case of The Grudge, however, Shimizu is able to sidestep the pitfalls that Sluzier tumbled into, and has been able to at least retain his own spooky visual vibe that seems to so uniquely personify the look of modern-day Japanese horror. This reworking casts Sarah Michelle Gellar as the lead, a transplanted American working as a home health caregiver in Japan. Gellar's Karen Davis is called upon one day to fill in for a missing co-worker (who we see meet a nasty end in the film's opening sequence), to care for a nearly catatonic woman (played with wide-eyed silence by Grace Zabriskie) who lives alone; unknown to poor Karen, her new patient happens to be in a house with something very, very evil lurking in the attic. But that's only part of the overall story, as The Grudge loops around on itself, suddenly branching into long Gellar-less flashback sequences before trying vainly to connect everything together during the last 20 minutes. The story, though massaged a bit by screenwriter Stephen Susco, is largely the same as the original, and is supposedly steeped in the mythology of traditional Japanese folklore about vengeful spirits and unnatural deaths. I'd be a liar if I said the plot actually made complete sense to me at all times, and maybe something was lost in the translation along the way, but this is really more of a spookhouse ride than anything else. Clarity and logic have never ever been necessary requirements for the horror genre, so beating up The Grudge for seeming to go against what we're told in the film about the actions of the spirits involved might be nerdy nitpicking, or maybe I just missed something somewhere. Without going into too many particulars here, I just didn't get why KaDee Strickland (playing the daughter of Zabriskie's character) was targeted by benevolent forces at her workplace AND at her apartment, other than for Shimizu to deliver some disturbingly chilling visuals. It is one of the best sequences in the entire film, but it doesn't seem to have a real purpose to the best of my knowledge. A lot of horror films eventually fall apart both visually and structurally, as if the director runs out of good ideas too early and drags things out too long. Shimizu's circuitous pacing, and his keeping the film at a brisk 90 minutes, prevents The Grudge from getting stagnant, and as bad dream eye candy it has its moments, even under a PG-13 banner. Gore Verbinski, however, did it far better with the remake of The Ring, a PG-13 horror film that was often more frightening than any combination of R-rated flicks, though Shimizu has the same litany of bloodless jump scares featuring scary, white-faced children who move with herky-jerky quickness. I'll admit Verbinksi's version genuinely spooked me in spots, but I just can't say the same about The Grudge. Yes, I jumped in my seat a couple of times, thanks to some sudden thing leaping out of the shadows, but I never had that goosebumpy sense of permeating unease that makes a great horror film memorable. Image Transfer Review: The Grudge is presented in 1.85:1 anamorphic widescreen for this release, and though this is a generally dark film often layered with icy blues and blacks, the color reproduction accurately retains an eerie, slightly mechanical radiance. Image detail, especially for such a shadowy film, is quite good, but some haloing and shimmer, as well as a few minor blemishes early on, mar an otherwise decent transfer. Audio Transfer Review: Audio is presented in an above average Dolby Digital 5.1 surround mix that is as aggressive as it is effective. Full of swirling creaks, moans, wind, footsteps, and deep, resonant bass, the audio makes this a treat to listen to, and works very hard to build Shimizu's intended mood of unease. Dialogue is perfectly clear, but it is the mixing of the sound effects and score elements that elevate The Grudge to the kind of encompassing experience that nearly makes the film seem much better than it is. A French language 5.1 track is also provided. Extras Review: I'm not a big fan of the "crowded commentary" option, but that's what's offered here, with Sam Raimi, Ted Raimi, Rob Tappert, Stephen Susco, Sarah Michelle Gellar, KaDee Strickland, and Jason Behr all chiming in together on the experience, in what is a surprisingly wacky and laugh-filled track. Sam Raimi on his own is just about worth the price of admission any time in my book, and thankfully he and Susco get into some intricacies of the development and shooting in Japan, but often its Gellar or Strickland chuckling about this or that. Gellar comes off quite likeable and self-effacing, but it is Sam Raimi that should be the real reason for listening to this track. Next is a five-part documentary that runs 48 minutes, broken down into the following separate sections: The Birth of The Grudge, The Myth of Ju-On, Culture Shock: The American Cast in Japan, Designing The Grudge House and A New Direction: Understanding Takashi Shimizu. Despite not completely adoring The Grudge all that much, I was rather surprised at how enjoyable these short featurettes (or one big doc, if you use the Play All option) were, and the segment on Shimizu was particularly enlightening. A standalone 13-minute piece entitled Under the Skin features author Joseph LeDoux, and offers a pseudo-educational look at how the human brain responds to fear stimulus, and why horror films often do what they do to us. Neat. In addition to a large number of trailers, the slipcased disc is cut into 28 chapters, with optional subtitles in English, French or Spanish. An outstanding and aggressive audio presentation makes the DVD release of The Grudge a lot of fun to watch, even if the story doesn't always make sense. Note that I said "fun", and not "frightening". Shimizu relies too much on jump scares for my taste, and that seems to diminish its long-lasting impact as a truly scary film.